To be honest, I was expecting something along the lines of Kancolle, where the girls themselves are the ships, so I wasn't expecting much. But by the end of the episode, it turned into something much like Arpeggio of Blue Steel. I was hooked after the halfway point and was left with a cliffhanger. What started out as a comedy turned into a very serious action episode. While I'm not completely sold on all the characters yet, the mc is at least not super annoying, and she is capable on her own. As GATE was last season, this will be the series I will keep up with. Girls Und Panzer at Sea! If you enjoyed the famous show about girls driving around in tanks that is Girls Und Panzer, then this is a show to watch. Haifuri follows along similar lines to Girls Und Panzer in the way that high school girls are given control of high powered military vehicles, only this time its battle ships instead of tanks. Haifuri also has that same "alternate reality" story to explain the need for high school girls to pilot technologically advanced war machines. After just one episode I am instantly hooked. Not only does this show bring back fond memories watching Girls Und Panzer, but also is able to build a compelling plot arc after only 1 episode. This is a show I recommend everyone give a shot, since it has a chance of being a real gem this Spring season. I'm going to start off with I've never watched Girls und panzer! So if you haven't this review may help you! First off I thought "maybe it will be a moe anime about girls on ships" and to be honest it kind of is. but after watching the first episode it takes a really interesting spin that left my mouth wide open. Like everyone else I can't wait to see how the story unfolds and so far it has some pretty good potential. A textbook example of "Don't judge a book by its cover." Although this anime has been airing for only 5 episodes, I'm hooked on the whole concept. When I saw first High School Fleet for this season, I was given the impression that this anime was to be another high school comedy, just on... ships. The colors in the poster gave off that vibe, and the characters looked stereotypical to the genre. Instead, I got a fun, mysterious, and almost intense first episode. The following episodes only built-up what the last episode had developed, keeping an almost consistent format so far (like, really consistent; maybe to the point of repetitiveness). I'm not saying this anime is particularly unique or even worth being called "the best," but I urge some people to try watching the first episode and form their own opinions. I can see this show appealing to some, but just being another one of "those shows" to others. Just saw the first episode, I'm curious to see where it goes from here. The show has a lot of potential, lets see where it goes! Ship animes (Arpeggio and Kancolle) finally come to a full circle with a GuP like setting. I hope they have other WWII nation's ships besides just Japan, Germany and America would be a welcome addition. I was expecting NOTHING of High School Fleet and when I start watching the 1st episode, it was waiting for a confirmation but ... I was wrong. This anime is a perfect example that you can make a silly "slice of life" with a touch of drama, adventure & action. Be advise, this is not Girls und Pancer nor Kantai Collection, if you want to compare it with something similar then you can try Tactical Roar or Starship Operators. Needless to say, don't expect a gem. The story is not great but I can ensure you that you will spend a nice time watching this anime. So what would they do with them? Well of course they would only do good things. Meaning the laws of physics and probability have to be altered to see that nobody ever gets hurt and the good girls always win and that the bad guys can only be seen to be like rats. 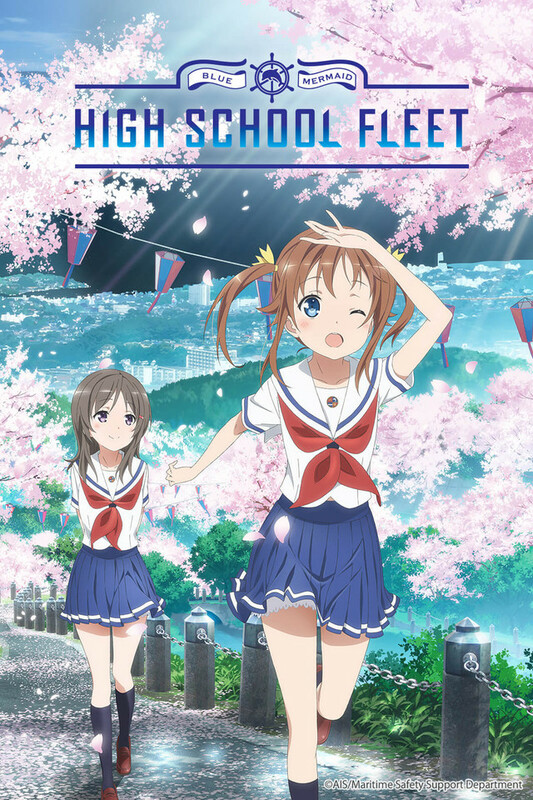 High School Fleet is a story unsure whether it wants to be a farcical comedy or something more serious resulting in an inconsistent narrative. The best parts are the comedic where our girls try to treat the ship like a domestic setting and the cringing worst parts are where the bridge crew share their feelings in the midst of a life and death fire fight. Fortunately the enemy is always considerate enough to stop shooting at them at these times. The protagonist Akeno Misaki is another Miho Nishizumi or Nagisa Furukawa clone. The diffident irresolute mousy haired girl. The worst person to captain or command other people. Fortunately she is endlessly propped up by her female fellows as she stumbles forward with the unstoppable power of anime physics behind her to win the day and save everyone. No exceptions. No need for anyone to get hurt in wars. Good message for the young. The rest of the characters are pretty much the usual mixture of arch types. The first officer Mashiro Munetani fits her role most adequately of all the girls keeping it all from sinking and chief engineer Maron Yanagiwara plays at being Scotty from Star Trek. The artwork and effects are of a good standard. The music track fits the setting. The ships are modeled accurately and animated nicely. Sometimes the size scales are off a bit. 'High School Fleet' attempts to be 'Girl und Panzers' with ships instead of tanks and a bit more serous. But it does not work and consequently it is not as good. Strangely enough the only foreigners to show up are the Germans again. The only great power of last century the Japanese did not fight, does that say something? While watching I frequently forgot that this was about girls at school because of all that was at stake - just one shell hits their ship and they all die! High School Fleet has one thing up on most other school based anime, the girls have a justifiable reason for wearing the sailor suits. Go watch Girls und Panzers first and if you like it then give this a try. i honestly came expecting a anime where cute girls do cute things , but i was surprised by the way it ended up being and honestly it surpassed my expectations. and i'm glad that is not slice of life show that i was expecting because that made it even more interesting , i'm looking forward to se what's going to happen and the way the gonna unfold the plot of this anime.